Olá pessoal, este será o primeiro texto em inglês no site. É porque o destino é muito bonito e há déficit de informação na internet inclusive na língua inglesa. Desta forma, acredito que posso ajudar mais se deixar o texto em inglês. Convido você a treinar sua leitura na língua de Shakespeare, enquanto treinei minha escrita. This is gonna be my first post in English in this website. I believe there’s a lack of information online about this region in South America, so I’m trying to make my contribution for the network! How do you feel viewing the image bellow? 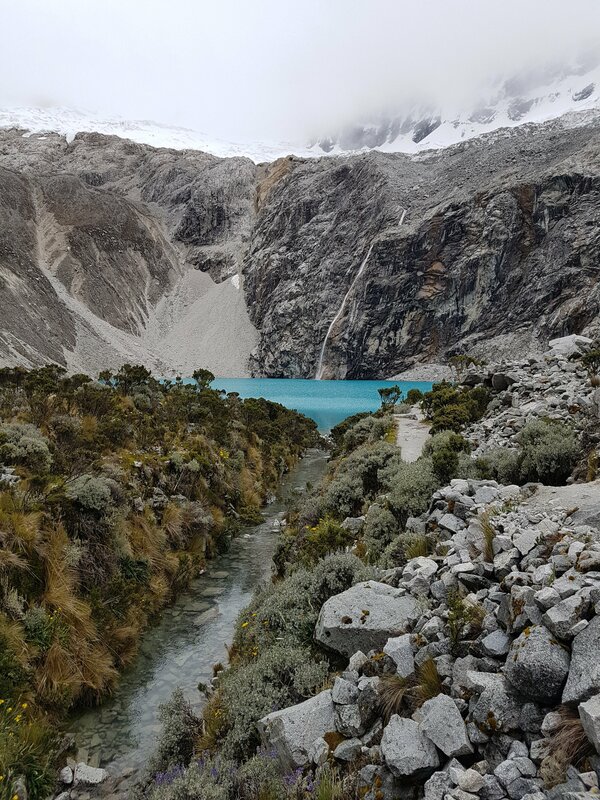 Lake 69 in the Ancash region – Peruvian Andes mountains. Do you feel confortable? Happy? Maybe curious? 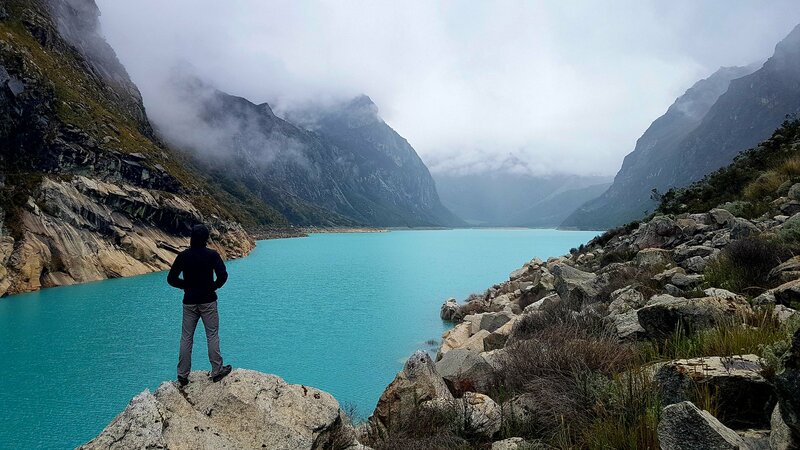 Today’s post is about an incredible lake found in Peru. 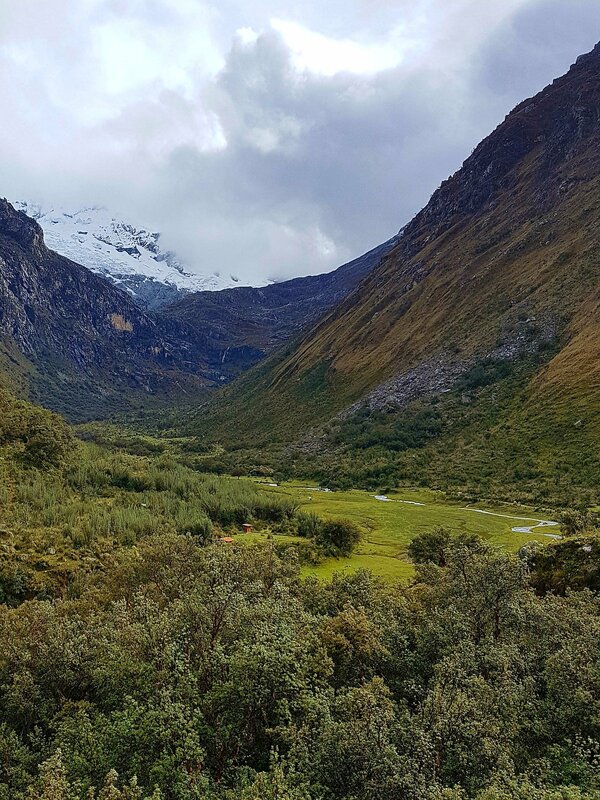 If you ever wanted to explore the Andes Mountains, trek in green fields, see glaciers and snow capped mountain peaks, incredible blue lakes… This place might be for you. 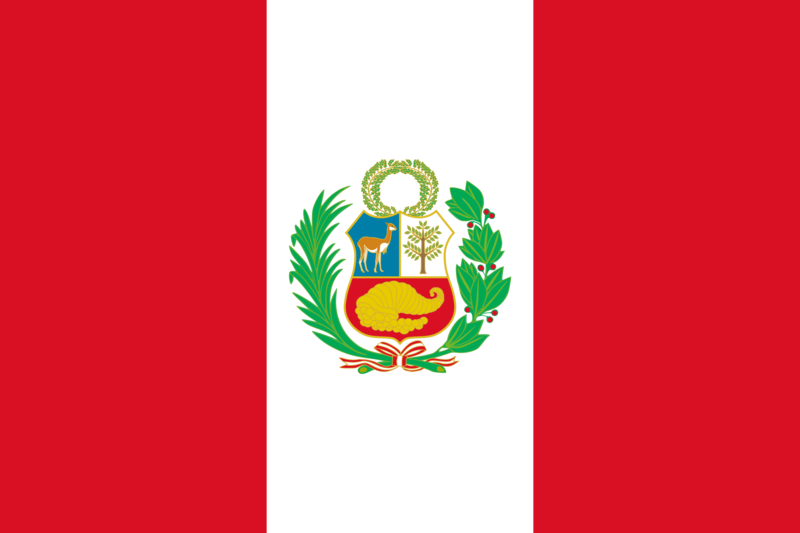 Although Peru is mostly famous for the great (one of the 7 wonders of the world) Machu Picchu, there are so many other places to visit and things to do: explore the Titicaca Lake, visit Colca Canion, check colonial cities like Arequipa, eat the rich Peruvian food Ceviche, surf the pacific waves all over the coast, and a lot more to discover. 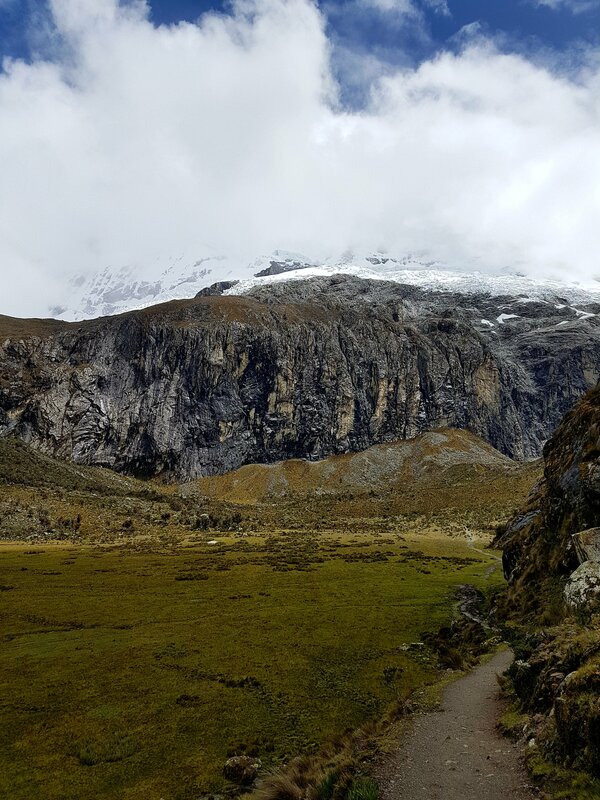 In the Ancash region, beautiful mountains rest and are called Cordillera Blanca (White Mountain Range). 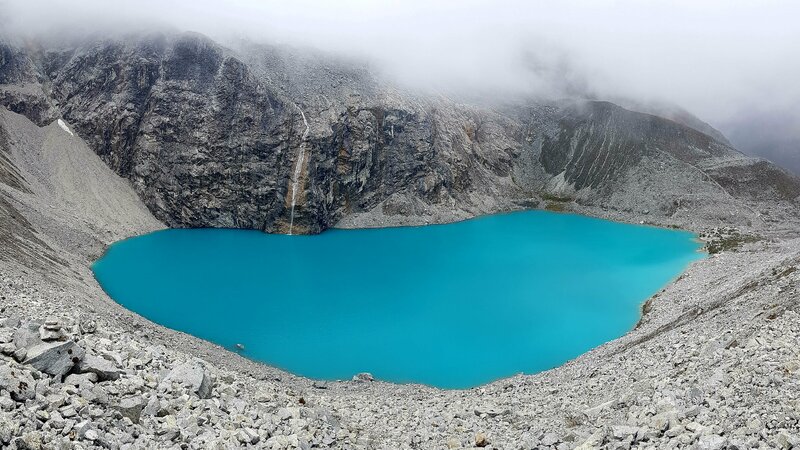 It’s a piece of the great Andes, and it’s well known for the white peaks and stunning lakes. You may click in any photo of the post to enlarge and view it. 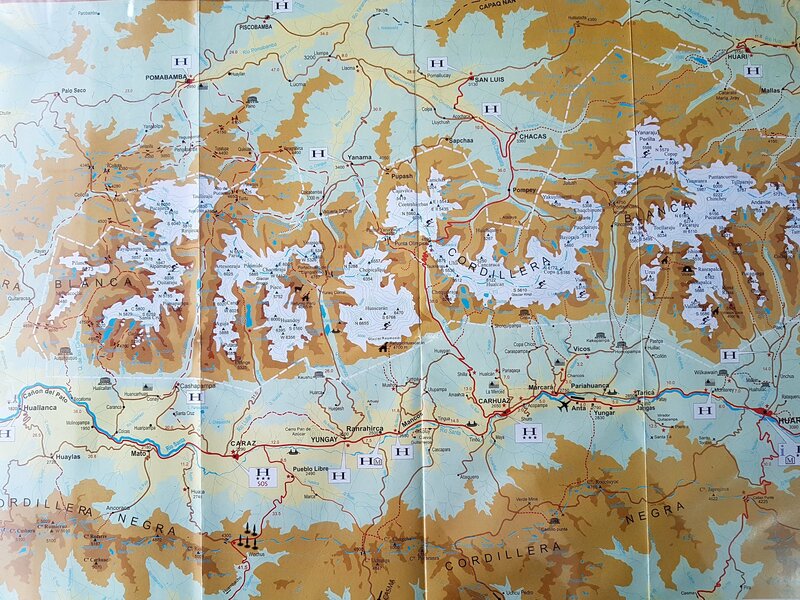 Cordillera Blanca Map to download. My friend and I had the opportunity to also go to Lake Perón, a marvelous place as you can see bellow. 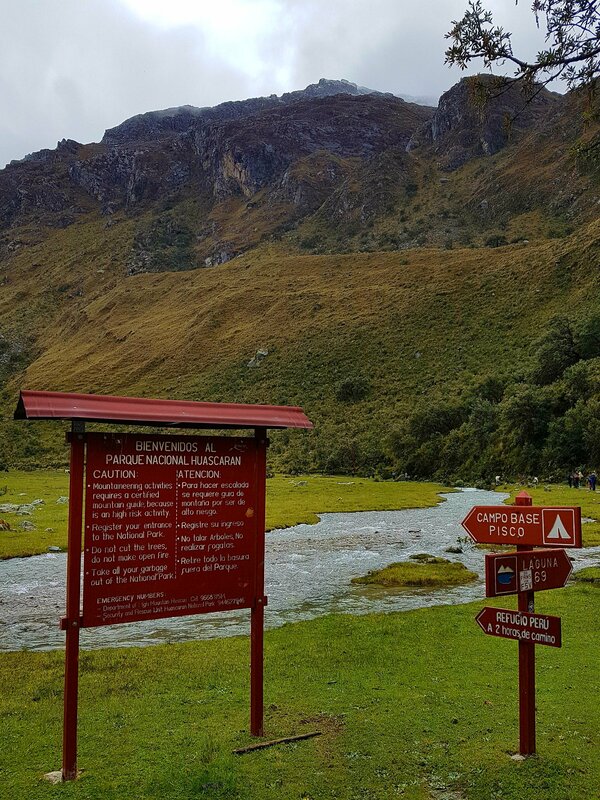 MD standing by Laguna Parón – Ancash Region – Peru. 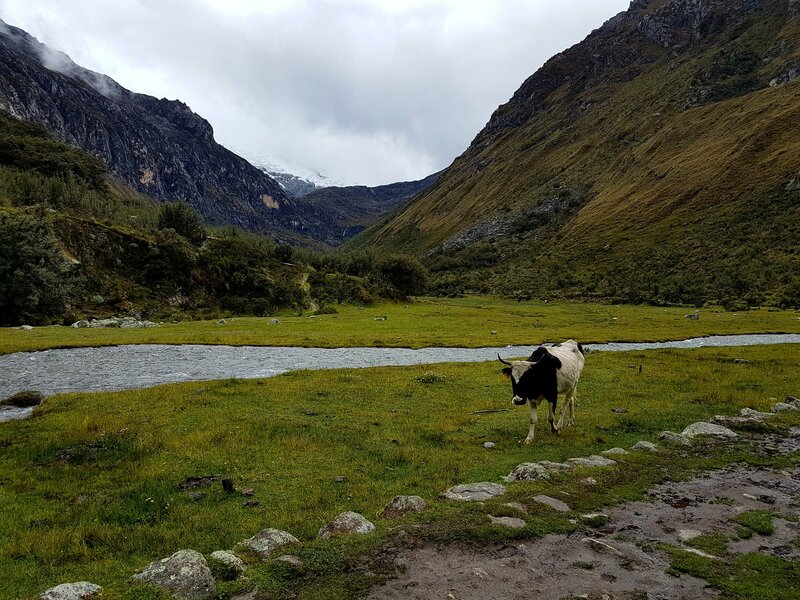 The main city to stay there is Huaraz, and it takes 8 hours to get there from Lima by Bus. These two companies drive the way: Cruz del Sur and Oltursa, but there are other cheaper too. 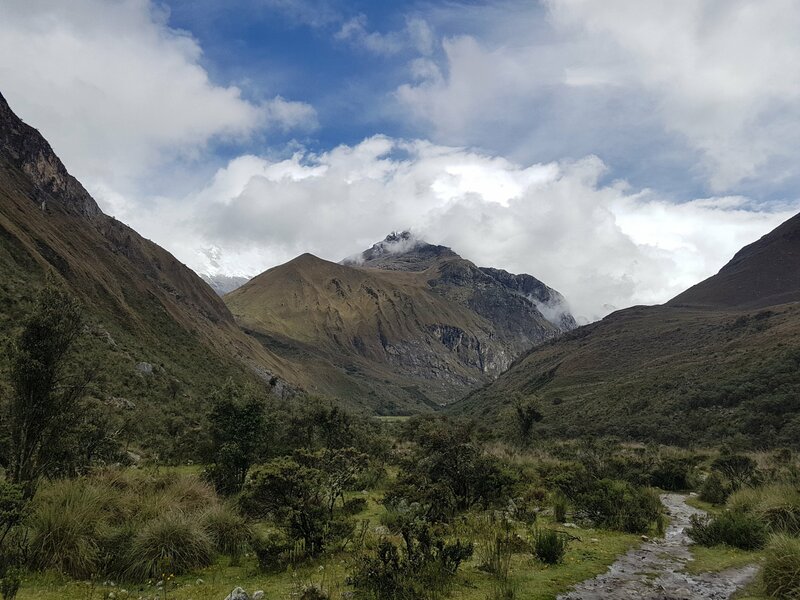 We went with Oltursa and the paid return ticket Lima-Huaraz-Lima cost 105 PEN (33 USD / all prices related in this post are up to date in Feb-2018). 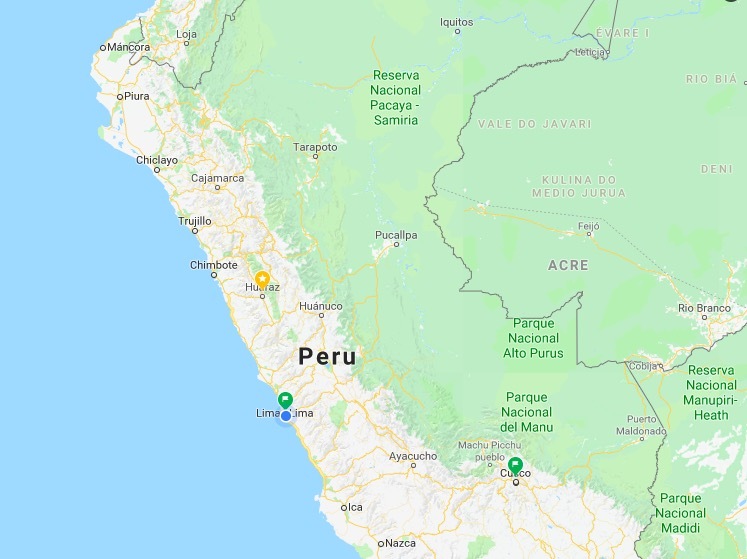 Datail of Peru map. 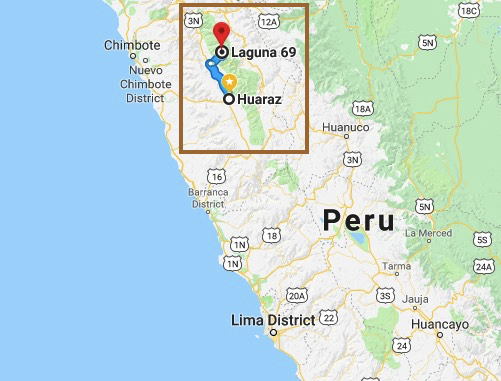 For reference, Lima and Cusco are pinned with green and Huaraz with yellow. 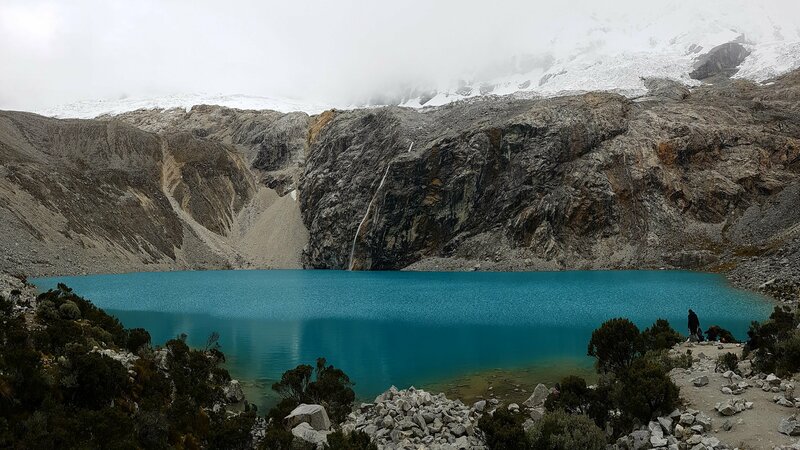 When we got to Huaraz, we had to book our tour to Lake 69. 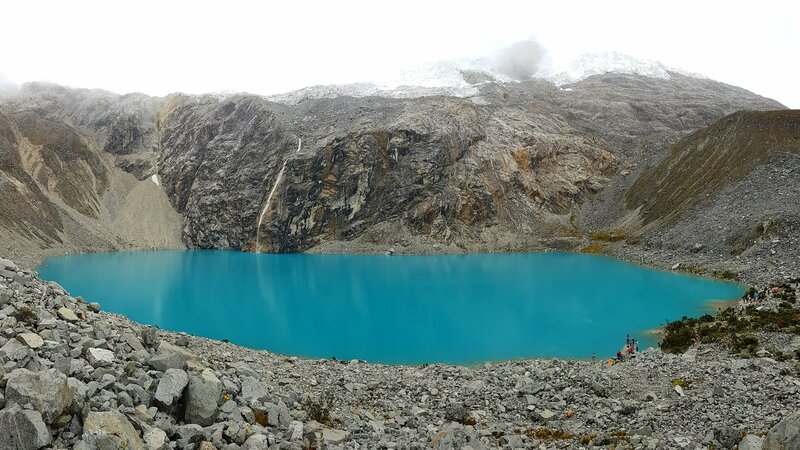 Laguna 69 stays inside Huascaran National park, and the entrance fee cost for this lake cost 30 PEN (9,5 USD in Feb/18). Huarascan National Park is the green area inside the brown rectangle. 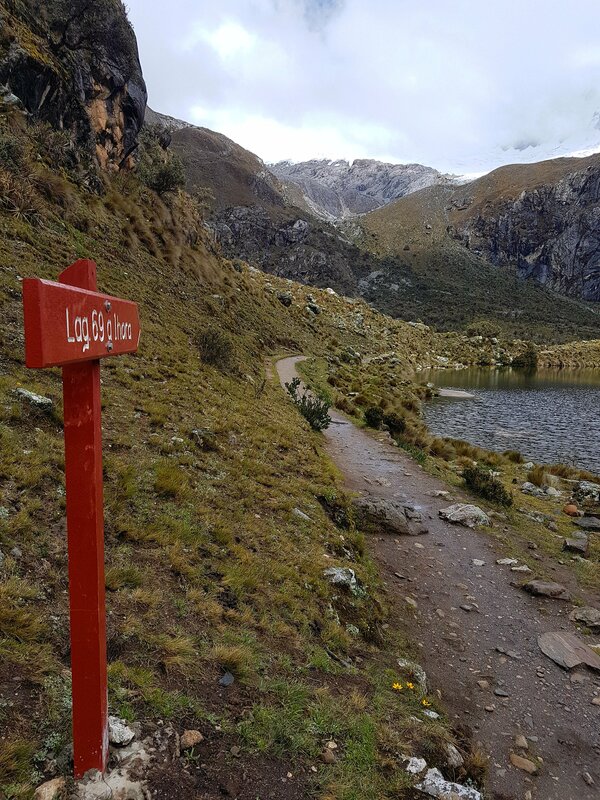 3,5 hours to drive to the beginning of the trail (with a 30 min stop for breakfast and 5 min stop to take photos of lakes Llanganuco). 3,0 hours to hike until the Lagoon 69. 1,0 hour to enjoy the lake area. 2,0 hours to go down the trail. 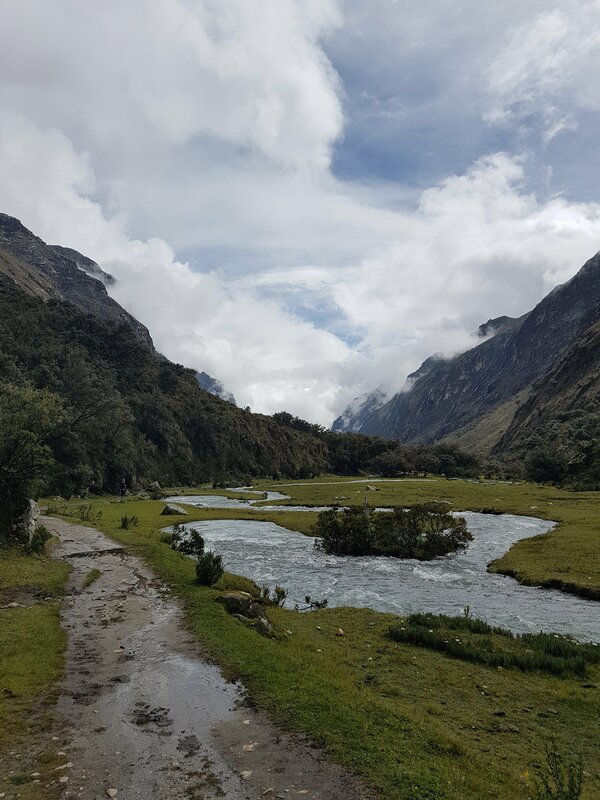 3,0 hours to get back to Huaraz. The picture bellow indicates the trekking we did, but first I’ll say some interesting facts. 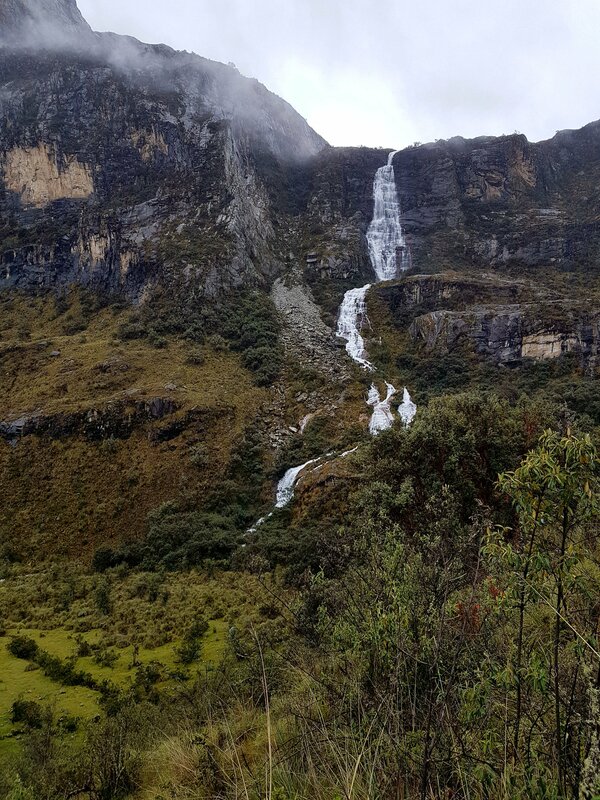 Huaraz is situated at 3050 m high, higher than any place in my home country Brazil. The start of the Trek is at 3920 m high. 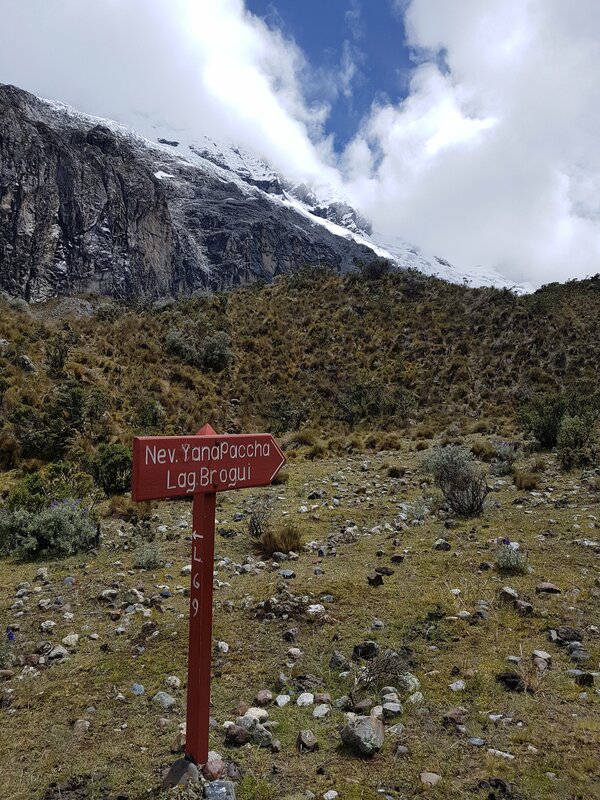 Lagoon 69 is at 4600 m, making the delta elevation of the trail to be aprox 700 m.
The lenght is about 6,3 km. There are 2 main up-hill sections, but the rest of the trek is easy. 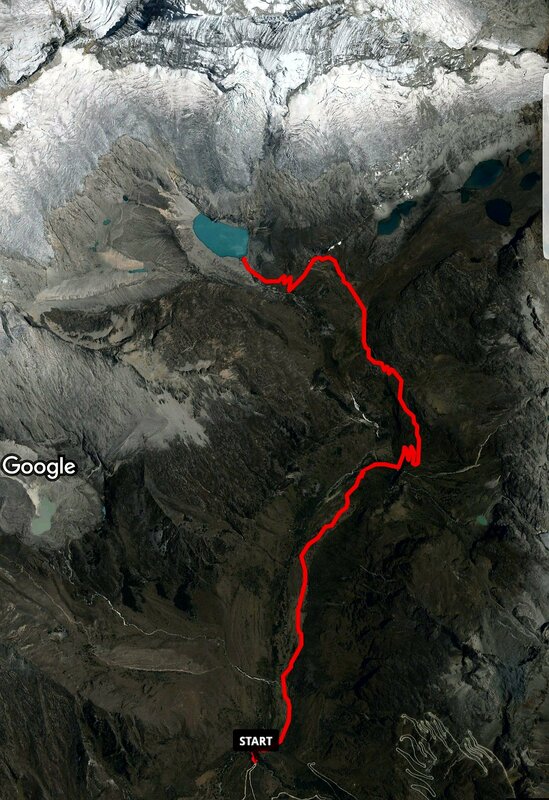 Satelite image of the trek. The zig-zag areas are the kikes way up. Remember to click the photos for a better view. We got to the start point of the trek at 8:30 am. The photos bellow are in the very beginning of the trek. You may click on the photos to enlarge it. This small stream you can see on the photo leads the first plain section of the trail. Basically you follow 2,8 km besides the stream, it’s easy, we found many cows on the way. It’s a pretty nice walk. The elevation gain in this section is 160 m, average inclination 3 degrees. After those 2,8 km, it’stime for the first hike up. This first level has the elevation of aprox 260 m made in 1 km, resulting in an average inclination for the section of 15 degrees. Definitely it’s a section to sweat. Remember that you are also above 4000 m, so our body lacks oxygen while making such an effort. Short pauses to rest may be useful. While hiking the way up, you can see the valley and the view of this nice waterfall. After that way up, there is a section we find a wide open area. There is another Lake in this area of the National Park, but we didn’t have time to explore it all, so we followed the signs to the main one: Lake 69. This section is a moderate plan, you hike 1,8 km and elevate 170 m. Inclination of aprox 5 degrees, not much. To Laguna 69 or Brogui. Finally we get to the last hike up before reaching the Laguna 69. It’s a 180 m elevation gain in 0,6 km (17 degrees of average inclination). 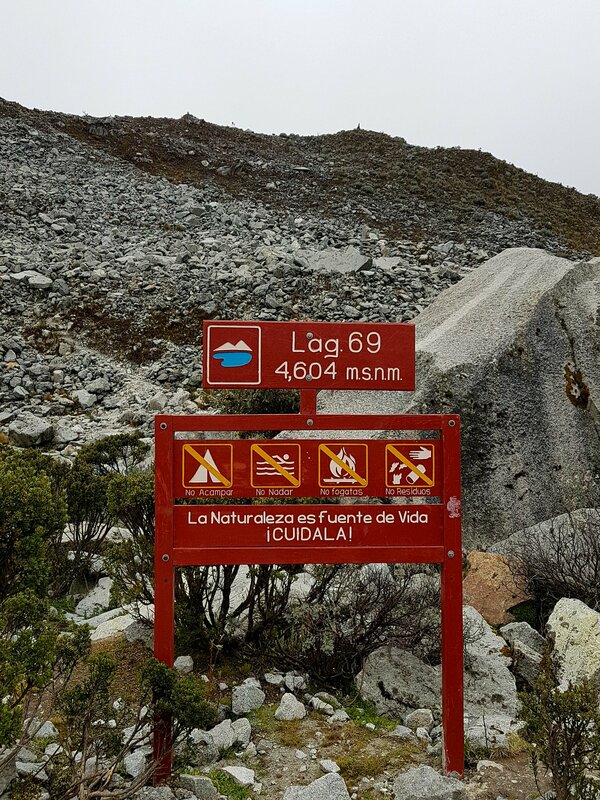 After hiking all that described, we may see the Lake 69! Its time to enjoy the view, rest, chat with other hikers and eat the sandwiches brought for the day! I have to say that it’s forbidden to swim in the lake and for sure the water is freezing cold! Lake 69: 4600 m above mean sea level. Lake 69 view from above. You may see other explorers (or hikers) very small on the right side near the lake on the photo above. And the photo bellow was taken after everyone had left to go back to the bus. The place is amazing. This view is achieved hiking even more to a higher level than the Lake. As you may see, the day we hiked was very cloudy, so the photos could have been prettier in case it was sunny. However, I never get upset, because I understand the Nature should be appreciated in all its forms… including the weather. Although the guide says it takes 3 h to get to the top, it took me less than 2,5 h, so if you are fit you can stay more than one hour by the lake on the top. Depending on the season, it may be very cold (remember 4600 m high), so it’s important to take a good jacket. While hiking it will be very warm, but staying on the top resting will cool your body and a jacket is needed. Take also food with you because the whole day is spent in this tour. 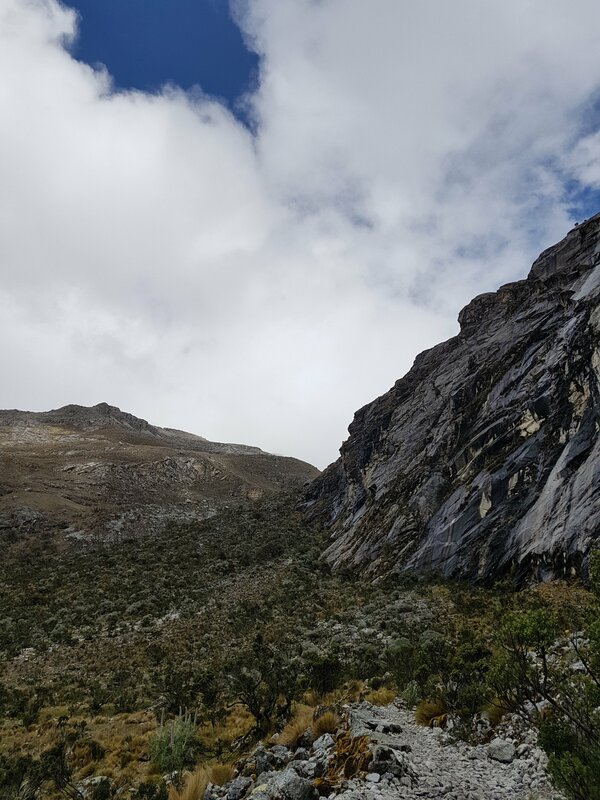 If you haven’t been acclimatized to the altitude before, you may get a little bit of high sickness. Be aware and prepare yourself for thet. To go down the way to the bus, the way is the same. Take care with your knees and enjoy the last moments in the park. I had to run my way down because I stayed 30 min alone (and late) on the top! The way down took me 1,5 h.
Well guys, I guarantee this region is amazing, it’s stunning! If you love Mountains, Lakes and Hiking, it’s a must check place. There are lots of treks to do and lakes to see. 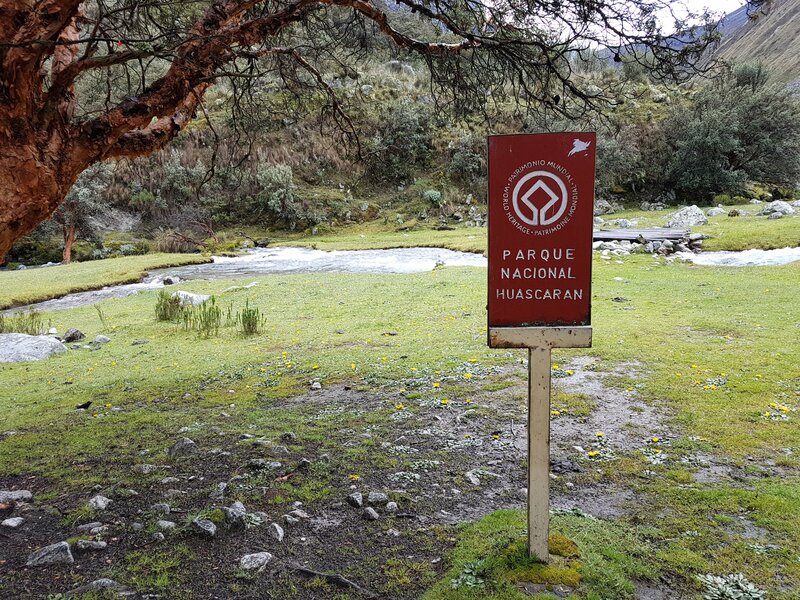 I had only two days in Huaraz, so I chose Laguna Perón and Laguna 69. I’m very happy with my choice. I hope I shared a little of my experience there, that I pushed you to see the region, and in case you are going there, that I can help you on your way. Cheers and see you Elsewhere!